Photo courtesy of EMG, Inc.
What do Led Zeppelin’s John Paul Jones, Pink Floyd’s David Gilmour, Prince, Slayer, Fleetwood Mac’s John McVie, Primus’ Les Claypool, Keith Urban, Metallica and Black Sabbath’s Geezer Butler have in common? If you guessed that they’re all top-notch musicians, you would totally be right! But wait, there’s more…all of them play guitars and basses loaded with EMG pickups. In 1976 Rob Turner founded EMG, Inc. [Electro-Magnetic Generator] – originally known as Dirtywork Studios, then Overlend – manufacturing guitar and bass pickups and other guitar and bass-related accessories. EMG has created a wide variety of single coil and humbucking passive pickups, extended range pickups, acoustic pickups and more, but they are widely known as the first company to introduce active pickups, solderless pickups and pickups for banjos, too. I would like to thank company founder, owner and sole engineer Rob Turner, for taking time out of his busy life to answer some questions for us! One Louder Magazine: Hi Rob, in your early years you played drums, yet you built and repaired guitar amplifiers. Did drums not feed your desire to work on electronics? OLM: So, as a drummer, what is your attraction to the guitar? RT: I suppose I could have made the first electronic drums, but… I didn’t. The attraction was that really nothing had been done in the guitar world for pickups that incorporated electronics. Microphones already had built-in preamps and for good reason. I just saw the existing guitar pickups as limited in all kinds of ways, so why not experiment with guitar? Everyone thinks they can play a drum. OLM: Can you play guitar? Who are your influences? RT: I can play a guitar, but I’m not proficient. I would say the most important part of what I do is listening. Having a good ear is really more important in what I do. I only have drummers as influences; I would say pretty much most English drummers from the British Invasion and later… Mitch Mitchell, Dave Clark, Ringo, Ginger Baker and B.J. Wilson. As for U.S. influences: Buddy Rich, Joe Morello, Elvin Jones, Al Jackson and Clyde Stubblefield. OLM: Your claim to fame is that EMG was the first company to introduce active guitar pickups. What is the difference between an active pickup and passive pickup? RT: An active pickup has a preamp directly following the coils. The EMG preamp does much the same as a mic-pre does. It removes any common-mode noise, provides impedance matching and can be modified in a number of ways to make the pickup sound different. Pickups are like paint brushes; some folks like ‘em big, some like ‘em small. To each his own. Passive pickups have their place, and EMG makes passive pickups. For me, the greater benefit to be had is in the active design. OLM: So you had this revolutionary idea, yet it took several years for it to take off. In fact, early on, guitarists spouted that “Batteries belong in toys, not in guitars.” How did you persevere through these tough early years and criticism? RT: The battery thing was never a real problem for me. My attitude has always been “get over it”. Wah-wah’s [guitar pedals] were already out, fuzz-tones were getting big and so batteries became a part of the business. Yes, it was difficult to convince players to put a battery in their guitar, but the result was well worth it. OLM: Five years later, in 1981, you teamed up with Steinberger. Each of their guitars and basses came stocked with active EMG pickups. How did this come to fruition? RT: Ned [Steinberger] was in touch with us as far back as 1978, but he never had anyone to believe in his ideas until a couple of years later. So he was an early proponent of what we were doing. “He got it”. I would have liked to have EMG’s on a less notorious instrument, but it all worked out great in the end. Ned and I still work together to this day. We were also introduced to [Harold] Hap Kuffner, a partner with Steinberger at the time and Hap helped us tremendously. OLM: Yet even with this new partnership things didn’t really start taking off until 1983, when you attended the Musikmesse tradeshow in Germany. What happened at the 1983 Musikmesse tradeshow that put EMG on the map? Why do you think you found success in the European market first? RT: Hap dragged us to Frankfurt when we didn’t have a pot to piss in. Both DiMarzio and Duncan had an easier go of it. DiMarzio was first, and out of the gate with “Super Distortion”, while Duncan took the reproduction thing to a new level. Now we come along and say you need a battery? The market wasn’t ready for us. Hap was selling Steinberger in Europe, so it was a natural progression for us to follow him. He had a pot. OLM: So EMG opens its doors in 1976 and you did not start finding success until seven years later, in 1983. Up until that point did you ever question what you were doing, consider other career options, selling the company/idea or think about getting out entirely? Did you feel vindicated after this initial success or did you feel the need to work even harder now that EMG was in the spotlight? RT: As the I Ching says, “Perseverance furthers” so I just stuck to it. Fender actually tried to buy EMG during their “Elite” stage, but their offer wasn’t the best. I figured if Fender is interested, then we should just keep going. It was tough, especially seeing the other pickup companies do so well. I’ve never stopped working hard. It’s sort of in-the-blood, so to speak, kind of a Turner curse. OLM: This newfound success also saw artist endorsements, starting with Steve Lukather, Peter Frampton, David Gilmour and Devo. How did these partnerships start? Did you seek these artists out or did they come to you? RT: We struggled for years hoping a good endorsee would come along. Musical products are sold by endorsement and that’s always been the case. We pursued some artists, but I guess good things come to those who wait and eventually artists figured out what we were doing, why we were doing it, and things progressed naturally. We had some great luthier/repairmen: John Carruthers, Tom Pellerito, Todd McCagg and others who believed in what we were doing and spread the gospel for us (and themselves). OLM: Later on, EMG pickups became a seemingly household name among hard rock and metal artists, with guitarists Scott Ian, James Hetfield and Kirk Hammet, Zakk Wylde and bassist Les Claypool joining the EMG roster soon after. Were you excited that top name musicians were now using your pickups or were you hungry for more? RT: The design of an EMG is different than ordinary pickups. Passive humbucking pickups are wired in series and consequently have high inductance, low Q and the coils are placed very close together. The coils tend to be “squat” and so the sampling area is very large. They also have a lot of “Mutual Inductance” as a by-product there’s an over-abundance of low-mids making the pickup muddy. Players like the amount of output from a dual-coil pickup, only their tone isn’t clean. When you’re playing a lot of staccato and quick runs, mud gets in the way. An EMG is built with taller coils, further apart, and they are summed electronically so the overall tone is cleaner and more linear. So, metal players tend to like them because you can hear what you’re playing rather than being lost in a fog. The original intent of an EMG was to make a pickup that “heard” the guitar and didn’t color it, at least as much as passive humbucking pickups do. The sampling area is still large, but the coils are more independent. 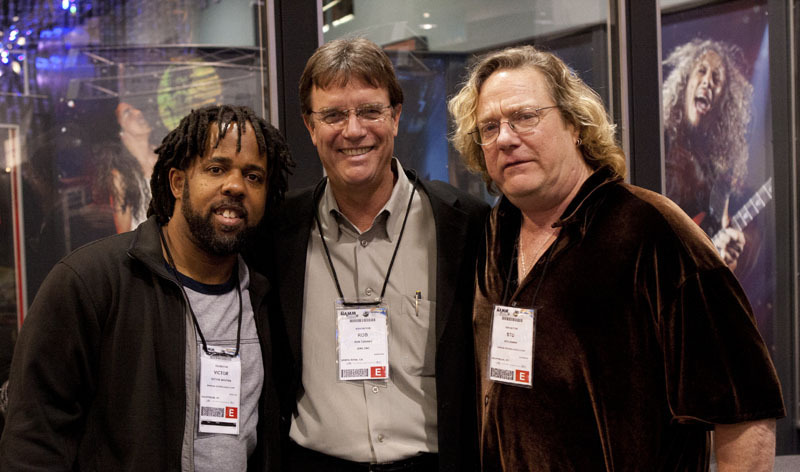 (left to right) Victor Wooten, Rob Turner and Stu Hamm from the 2011 NAMM tradeshow. Photo courtesy of EMG, Inc.
OLM: The EMG roster is packed with a star-studded all-star list of guitarists and bassists. Who is not on the roster that you would like on the roster? How do you plan on achieving this goal? RT: Start at A, then go to [Jeff] Beck, then to [Eric] Clapton, and on and on. EMG’s are not for everybody, but you don’t always want a 4-inch brush to paint the Mona Lisa. If they use em’ live or in the studio and they work, then I’m happy. OLM: What does a guitarist/bassist have to do to be considered for addition to the EMG roster? RT: Talk to Chrys Johnson, our Artist Relations Manager. Or, you can always call me. OLM: Have you been “star struck” yet? RT: I try not to be, but it does happen. When they find out I’m a drummer I think they feel less threatened. I’ve met some really great folks. The guys from Metallica are great, Dolly Parton was very sweet on me and Del McCoury is one of the funniest guys I ever met. I haven’t met a “star” I didn’t get along with. OLM: Steinberger no longer became the only guitars and basses equipped with EMG pickups. Today they come stock on many Gibson, Ibanez, Jackson, ESP, Schecter, Peavey, B.C. Rich, Washburn and Dean guitars. That’s incredible! How were you able to get such a hold in the guitar marketplace? RT: Well, we are the only source for EMG. It’s not like you can go out and buy a similar pickup at a factory in Asia. We spend a lot of time promoting the letters “EMG” and we add value to an instrument. The pickups might appear on a lot of company’s guitars, but we don’t do every guitar in their line. We also work closely with these companies and try to develop product with them, work directly with their artists and also share artist rosters with them to keep everybody happy. OLM: In more recent years you added solderless pickups to the lineup. What was your intention? How has the feedback been? RT: It always bothered me that someone needed to know how to solder in order to install a pickup. We started using the connector on the bottom of the pickup for production reasons. Then one day I got an e-mail from a guy who said “why don’t you take the connector thing all the way?” So I took his suggestion, went to work and fully developed the solderless system. The feedback has been incredible. A few repair guys accused me of taking install money out of their pockets, but they soon learned to embrace it. It’s simple, foolproof and fun. OLM: Last year you received an award for being a top manufacturer in the North Bay. What does this award mean to you? Why do you think you’re considered a top manufacturer in the North Bay? RT: I think it’s great being awarded like this. It goes to show that we take care of our people, because without them we wouldn’t be a manufacturer. The North Bay is a great place to be, and I’d rather retire here than in China. OLM: What could you do to make the company even better? RT: Move it to Tahiti. OLM: You have successfully balanced between being a savvy businessman and doing it in the (very fickle) music/entertainment industry. Would you say your strength is more in the former or latter? In other words, do you think you could be a successful businessman regardless of industry or do you thrive on working in the music/entertainment business? Why? RT: I have really only had one successful business since the age of 23. So, that doesn’t make me a serial entrepreneur. I’ve been surrounded by great people who have helped me through the years. Their value cannot be underestimated. My success is largely based on focus. I’ve thought about starting other businesses, but I’m always drawn back to what I do best. I would put the same effort into any other business I started, but I’d really have to drop one business to do another. I don’t look at the pickup business as a music/entertainment business. The customer is that side of the business. I played professionally for five years and the lifestyle didn’t fit me. I like being ”behind the scenes”. OLM: EMG has been around for almost 40 years now. What do you think contributes to the longevity? RT: LSD (Low Stress Diet). Being able to bob and weave through market changes. Accepting less sometimes and enjoying the fruits of my labor. Since we make a good product and continue to improve the designs it makes it a fun place to be every day. OLM: Even with almost 40 years under your belt, the company is still private. Did you ever consider going public? Why or why not? RT: We’re not big enough to go public. If we were, I’d cash in, buy an island and go fishin’ in Tahiti. OLM: What are some highlights for you during this 40-year stretch? You must have some great stories…any you can share? RT: My favorite time in the business was working with Béla Fleck. I’m not especially close to him, but he’s the first person who ever thanked me personally for working on a pickup for banjo. He applauded my efforts, praised my perseverance and was very honest with me about what he thought. That’s the type of input I need to set me going in the right direction. I know it’s not much of a story, but I’ll never forget it and that works for me. OLM: You’re EMG’s sole engineer. Why have you not expanded and taken more of an owner/CEO-role, leaving R&D to others? RT: I haven’t always been the sole engineer, but I am now. My brother joined the business in 1978 and then we had Gordon Barnes for several years. It’s never been more than two as development engineers. My brother went on to start LSR Engineering and Gordon is elsewhere. But, I have three people who work for me who I consider engineers. They might not be development guys, but they’re damned fine engineers. I left the CEO role behind about six years ago. It gave me the freedom to develop the solderless ideas, start the X-Series Pickups and move to a new level of innovation, of which the banjo pickup is only the beginning. OLM: So you’re owner, sole engineer and more…do you have any typical days? What is a “normal” day for you? RT: Get up a 7am, be at the gym at 7:30, work out for an hour, then hang out with my buddies at the local coffee shop, go home, shower, get to work around 10:30, work ‘til 6 or 6:30, and hang it up. I don’t take work home with me; I get plenty at the shop five days a week. I find doing EMG work at home counter-productive. OLM: What is your favorite thing about working in the music industry? RT: I’ve made a lot of friends in the industry: guitar techs, musicians, security guys, sound guys, mixers, masterers, you name it. My favorite thing is hanging out with them when they come to town, or when I get a chance to get together with them wherever. I love trade shows too. I love a good crowd (read: party). OLM: Have you had a chance to reflect on the growth/success of EMG? RT: Every day I have kids who are coming into the business. I hope they like it as much as I do and don’t consider it work. They call it work, but it better be fun or I won’t show up. OLM: One of the most recent additions is EMGtv. What is EMGtv and how did it come about? RT: EMG-TV is a result of the internet and its video capabilities. I have never been a fan of print media. For me it has always been an evil necessity. There’s nothing worse than a piece of paper that gets thrown away after reading. When the magazines started to have internet sites, I immediately took our print/production budget, and moved it to video. Our website is filled with video and I love it. Also, we (meaning EMG) are the best communicator about our product and video is a direct connect to two of our senses: sight and sound. So now we’ve invested heavily and are doing production and video work for local ad agencies and turning it into an actual production business. I don’t work it; Jeff Brockman is the man who runs it. He’s very talented and I leave him alone. OLM: What is the future of EMG? What is the future of pickups? RT: Whew, good question. I view the pickup much like a microphone. You will always need one. I’m sure we will adapt our products to the newer digital age, but you still need a transducer to get the info out. As long as the guitar exists, so will pickups. Lucky me. OLM: How would you have done things differently? Any regrets? RT: Sure everyone has regrets. I should have learned to fly fish at an early age. Truthfully, I have no regrets as far as business is concerned. OLM: What advice would you offer to aspiring inventors? RT: Go for it. Read How to Write a Business Plan by Joe Mancuso. Don’t be discouraged. If at first you don’t succeed, try again. Accept help willingly, accept praise gracefully, be a nice person, love your wife, have kids, get rich, live long enough to enjoy your health and freedom. RT: I can be reached at emgpickups.com. I’m not big on social media. I have a Facebook page, but rarely go there. I like Khan Academy. OLM: The desert island question: if you could take the collected works of five artists, who would the five be? OLM: Who are some of your guilty listening pleasures? RT: The Grateful Dead live or studio from 1967 thru 1974. Any Bonnie Raitt, and for that matter, any music with slide guitar in it. Talking Heads. RT: Sunshine Daydream (Veneta, Oregon). Google it. Thank you so much for the kind words and apologies on the delay! The One Louder Magazine “website/blog” is a labor of love, so unfortunately we only release 3-5 “issues” per year. Having said that, there are more frequent updates on our Facebook (www.facebook.com/oneloudermagazine) and Twitter (www.twitter.com/oneloudermag) pages. To answer your questions, I have a web/layout guy who takes care of that end; I think he has a great eye, as well, so I leave that all up to him. I just provide him with the content, making minor suggestions here and there before going live. So, yes, he customized it himself, but I’m not really sure what he did. I can find out if you are interested, though. While I don’t pay for the layout, I do have to pay for the URL, email addresses and a couple of other things. It’s pretty cheap, so it’s really a non-factor…again, a labor of love! Thanks again for the kind words…and happy reading!